Case Western Reserve University invites you to be a part of an extraordinary opportunity to restore the grandeur of The Temple – Tifereth Israel in the heart of University Circle and create a more vibrant campus experience for all. 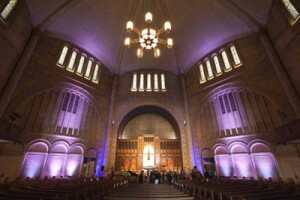 Catalyzed by a $12 million gift from the Maltz Family Foundation of the Jewish Federation of Cleveland, Case Western Reserve and its supporters are poised to renovate The Temple into a premier performing arts space, while preserving it for use as a place of worship and celebration for High Holy Days and special events. Constructed in 1924 and listed in the National Register of Historic Places, The Temple has had a significant spiritual and cultural presence on the University Circle landscape for generations. Its transformation into The Milton and Tamar Maltz Performing Arts Center at The Temple – Tifereth Israel preserves the iconic building and advances the university’s strategic emphasis on culture, creativity and design. The center will feature programs and performances in music, dance and theater and will house rehearsal space, classrooms and faculty offices—breathing dramatic new life into the celebrated structure. To start a conversation about supporting Phase II of The Milton and Tamar Maltz Performing Arts Center at The Temple – Tifereth Israel, please contact Elizabeth Klein, Director of National Giving at 216.368.5764 or exk347@case.edu.